Well, today I've tested some wood rendering technique. Wingnut Wings recommend the use of Tamiya XF-59 then Oilt (Burnt Umber) applied with a sponge, and "removed" with another sponge. 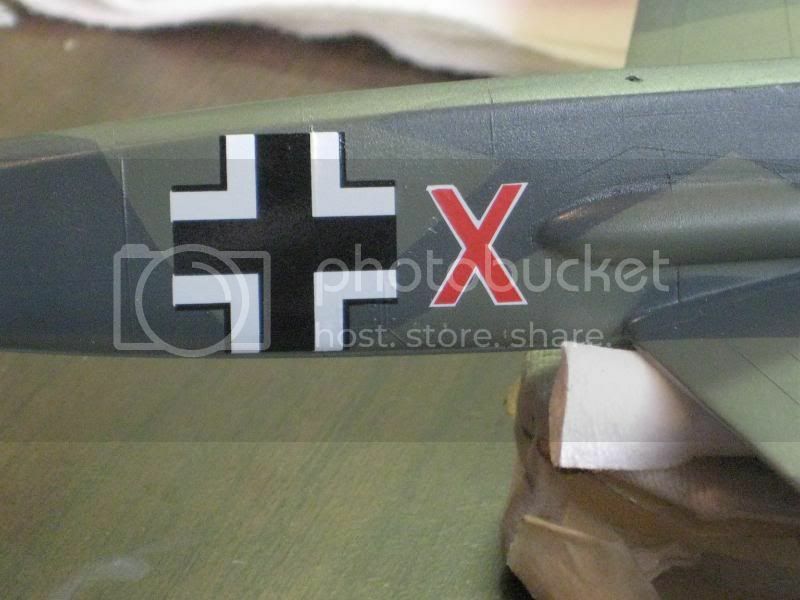 On the photo, the result given is show by the half-fuselage. ...So I've tried to replace the Tamiya XF-59 by Vallejo Yellow (left part of the wing on the photo) and Wood (center part and right part), using the same technique of Burnt Umber and sponge. ... And the result is exactly what I want. And...Thanks for share with us! !This is very useful! What glue you use to glue PE parts? Becouse everything is soooooooooooooooooooooooo tiny,and i don't know what type of glue i will use? A bit of a change-of-pace, making your own letters or numerals. Often I find that the markings I need for a particular model are just not available. In such a case I find a photo or drawing of the marking and copy it into the scale I'm building on my printer. Here is an example of this, using a Luftwaffe code letter. This one is easy since it's all straight lines, but I've had good results with other shapes as well. First, trim the character you need with enough surrounding paper to tape it to the appropriately colored decal material. Tape the perimeter of the copy to the sheet so that it cannot move during the cutting process. I cut the decal paper in small segments just a little larger than the printed subject so as to save decal paper. Use a very sharp hobby knife blade to then cut around the entirety of the character, making sure to cut deeply enough to scribe the decal. The next step is to soak the decal and then very carefully remove the excess from around the figure. Notice in this instance that one triangle of material was stubborn-I hadn't quite cut through all the way. A careful pass with the X-Acto blade corrected this. If the figure is one color only, simply apply to the model. In my case the letter has a white outline. To accomplish this I simply dab almost all of the moisture off of the red character and then slide it onto the white decal material. 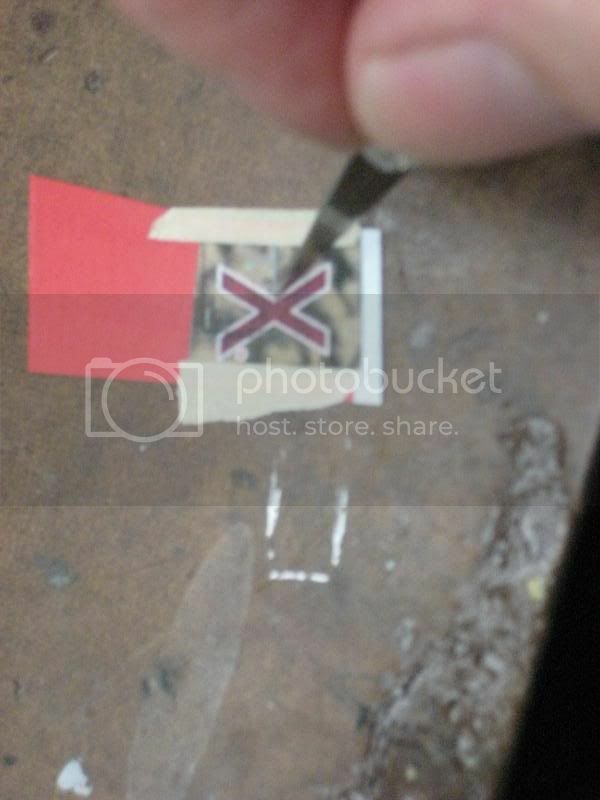 Make sure not to transfer too much moisture from the first decal film onto the second sheet. Now make sure that everything is dry before proceeding. The next step is to simply cut the correct width outer border color. 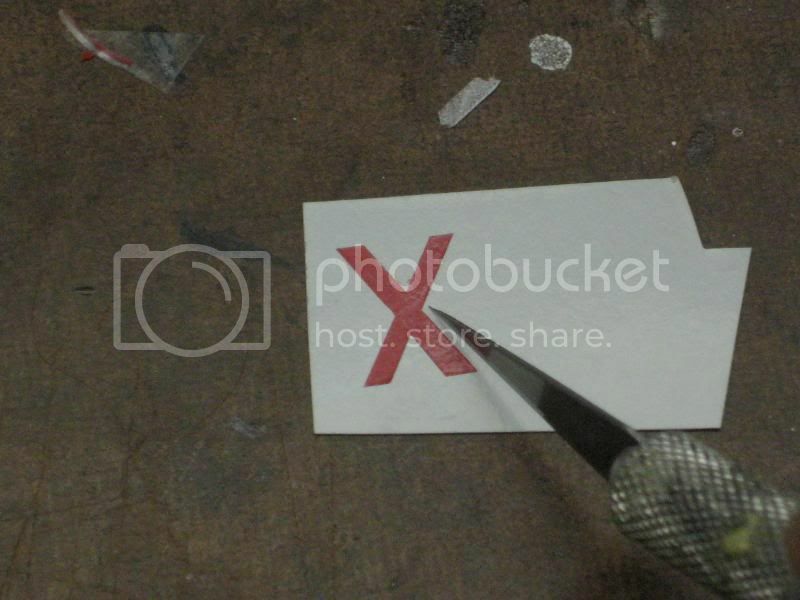 The final step is to wet the second sheet and repeat the removal of the excess decal film you cut free. 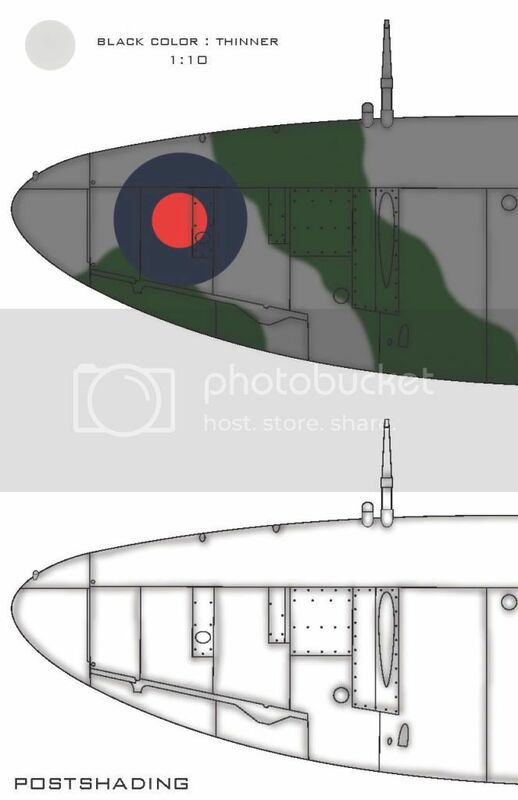 Then transfer the two-piece decal to the model. In some cases I spray a light coat of clear over the two decals before this step to bond the top film to the lower. Excellent tip, Scott! Thank you!!! Sall asked me to demonstrate some colouring and weathering tehniques of mine. To avoid any long discussions I made some materials to demonstrate the way to do it. 1) I used a spitfire wing to demonstrate the procedure. To recreate the scale model conditions I helped myself with photoshop. 2) First step after the model is coloured and the decals are on is to spray the whole model with matt varnish. This is what you need to do to prepare the model for postshading. With Postshading you actualy darken all lines betwen pannels with heavily diluted black paint. The lower picture on the white background demonstrates whitch parts needed to be darkened. 3) Next step is to lighten the central parts of the panels with dilluted sand color. You can use also gray for this stage. The spaces shoud be covered unevenly. 4) To break up the whole surface the higlights come handy. This is the third faze of weathering where you adress only few parts of the wing and higlight it with dilluted white color. 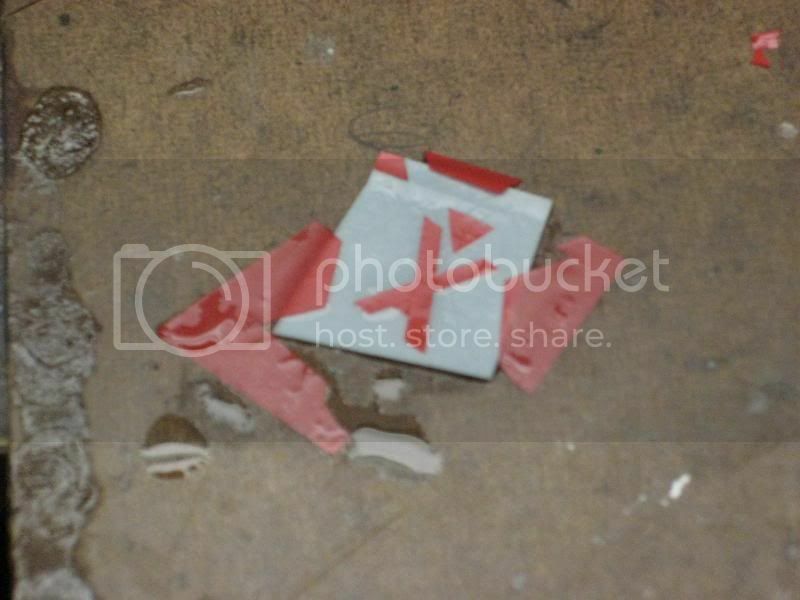 Be carefull to higlight the parts that are usualy disposed of wear and tear. This is all for now. Hope you enyojed. Thank you very much Primoz. Later i will read this topic in peace. Now i'm in bus, so i can't pay so much attention. Thank you one more. You will read my reply later. Ps. If any other forum member want to describe his procedure,there is no problem! I finally read it. Excellent!! Thank you. Is this techniques only for airbrush, or it can be used to work with paintbrush? 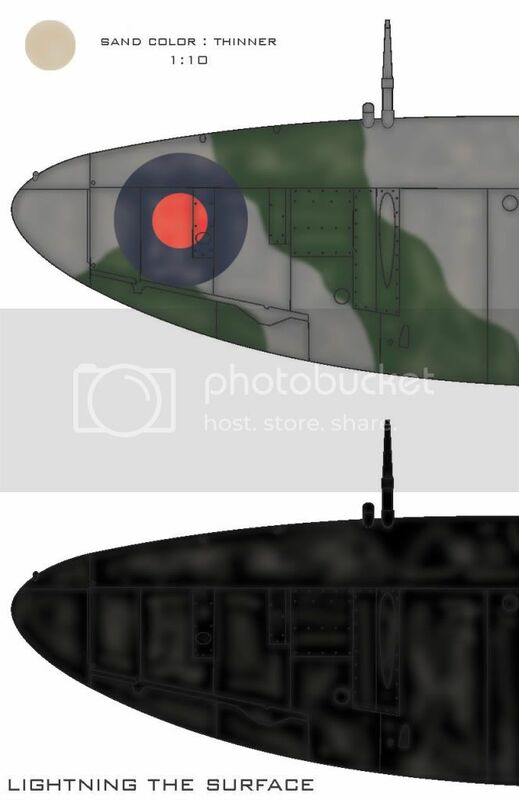 Here is some weathering tips I posted in another forum when I was building an Airfix Spitfire Mk. XII. I hope they might be useful to you! So my techniques are "quick" and a bit lazy. I don't model for contests at all. (I simply don't enter them. That's for another post.... I basically do things purely for fun. And I do not model for realism. Again, it's all for fun. If it's fun on one build to try and be realistic, I do. But often I just see what I can do and simply enjoy the journey. So anyway, with those caveats, I'm going to document how I weather aircraft at Roy's request, and a few others. I'll post it as I go along in this build. OK- so I started out with shooting just straight colors- no lightening or darkening. Right out of the bottle with some thinning. All of this is done with my Badger 105 patriot, and I shoot at 8-12 psi. 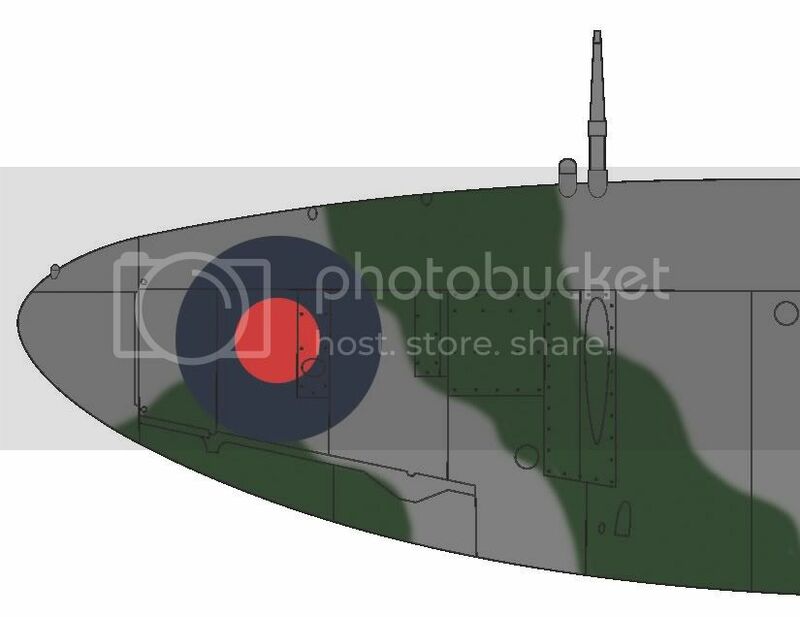 Here is the Airfix Mk. XII I'm working on. It's painted in Pollyscale Azure Blue undersides, and Pollyscale RAAF Foilage Green and Vallejo Model Air Earth on the uppers. The wing leading edges and tail surfaces are Tamiya Flat White. Anyway, I put two or three drops of Tamiya Flat White in the color cup, and then fill it halfway up with 91% alcohol, and mix it up. Then I shoot about half of it out. Why? To make sure I blow through all the thicker stuff. I want very, very thin paint. Then I basically start filling in between panel lines. I can't really see any color as I shoot, just a small gloss spot where the alcohol hits and is wet for just a second. I just keep filling in and filling in all over, every now and then checking my work. I try to get to the point where it's just a bit obvious, as later weathering will tone it down a bit. It takes some experimenting if you haven't done it. (Side note: I think the fact that I build 20 kits a year has really helped me because it gives me lots of chance for experimenting.) And I don't try to fully fill things in. I just sort of dodge around and make swirls and so forth. I don't even let off the trigger, I just jump from panel to panel. Next up are the panel lines. Some folks like to use dark gray, or a mix of Tamiya Smoke and NATO Black. I prefer Tamiya Flat Black. I want to see my post-shading. Again- that's the style I prefer, so adjust to your tastes. I put three or four drops in the cup, and then fill it halfway again with 91% alcohol. Again, I blow through half of the color, and then test it on a test surface. If it's a bit too dark, I add more alcohol, and repeat the procedure. I start by getting just the lightest flow going, and fill in the panel lines. At 8-12psi, with paint this thin, you can get a panel line sized pattern, so I just keep it real tight. I get right down on it- probably a half an inch or closer. Again- experimenting will yield great results. And I just do an entire section in one "pass". Basically, when I get the paint flowing right, I just start tracing the panel lines, almost like I'm driving around them. Up one, back down the other, across to this one. It will take 4 or 5 passes before you can see color built up. I like it to be rather apparent, so it takes a while. After I've done the entire aircraft, I go back and redo any areas that appear too light. I then go over them again, but this time from 1-2 inches away, going for a lighter look. This helps "soften" things up. - If I do the undersides, I may use a lighter color than flat black for the panel lines. On this one, I used Tamiya German Gray. - I generally fill in areas around the control surfaces, and major panel lines, a bit heavier. Also, areas that may have oil staining will get some additional coverage, as that will play into later weathering. On to Step 4- Playing with Oils! This next part is something I often use independent of the above methods. In fact, I generally don't combine them simply because I don't want to take the time. But I figure it would be neat to see how it turns out. The tools for this exercise are some artists oils in white and raw umber, a bit of odorless turpenoid (not the "green kind! ), a toothpick or two, and some wide brushes, about 1/4 inch wide, and somewhat stiff.. I mixed up a dab of white, and a dot (literally) of raw umber in a small cup, with some turpenoid, to get a dirty looking wash.
Next, I dip the tip of the 1/4 brush into this, just enough to soak some up, and I start bouncing it up and down around the wing until the whole thing is covered. it should not be soupy.... just moist. If it's too wet, just dab the brush on a paper towel until it dries up a bit. When I'm done, it leaves a fairly distinct layer of blotchy white. This photo does not show how prominent it is, but you can sort of see it. Once that dries- just 5 or so minutes will do, I take a clean brush similar to the one just used, and I dab it around as needed to tone down the effect. (Or, if needed, you can add more of the wash to increase the effect.) it's really cool because you can control the degree of "dirt" easily. if it's too much altogether, just rub it off with a bit of turpenoid. Step 5: Shine, shine, shine! I like to add some paint chipping. Because this bird is getting dirtied up pretty well, I'll go heavy on it. I use Tamiya Flat Aluminum (XF-16), a Prismacolor Silver oil pencil, and the same brush from step 4.
i start by getting some XF-16 on the brush tip, and dabbing it on to a paper towel until most of the paint is gone. Then I "bounce" it up and down wherever I want paint to look chipped, building it up as I go. I like this method because it "layers" the wear fairly nicely, and will stand up when later steps may tone down the effect. I then go behind that with a Prismacolor Silver pencil to add scuffs and so forth in smaller areas. It looks a bit heavy, but later steps- especially the Future and Flat Coat will blend it a bit. And the oils are forgiving enough that if you want to tone it down a bit more at this point, you can.